Tim Burton's Corpse Bride is a claymation animation tale that brings together two used-to-be rich families for a wedding that each thinks will save them from the poorhouse. The parents of the bride and groom are determined to make sure everything goes as planned. When Victoria, the reluctant bride, meets Victor, her shy husband-to-be, they are set at ease and look forward to the wedding. Unfortunately, a nervous Victor repeatedly flubs his vows at the wedding rehearsal and is sent away until he can prove he truly wants to be married to the lovely Victoria. By the night of the moon, at the edge of the graveyard, Victor finally repeats his vows perfectly as he slips the wedding ring onto a twig coming up from the ground. A beautiful corpse rises, the ring upon her skeletal finger, happy to have finally found a husband. Victor is whisked away to a bar in the Underworld, where singing skeletons and dancing mice welcome the new couple. This Corpse Bride has lost at love before when she was murdered by the one she loved, and now is not compelled to let her new husband go. Beneath the surface, the dead celebrate the new marriage; above the surface, Victoria wonders what has happened to Victor. AS Victor struggles to find a way back home, a jealous Corpse Bride clings tighter to her dream. A new groom, greedy for the family fortune, steps forward to replace the missing Victor. When the new wedding takes place, all seems lost to Victor. An oversight reveals that Victor must wed his new bride again, but only after he gives up his life. With Victoria now married, he agrees and a wedding is planned to take place in the land of the living. The Corpse Bride's happiness turns to sadness as she realizes that she has taken Victor from another, just as her own life had been taken from her. In the church, with the whole Underworld watching, she begins to accept that she cannot ask Victor to make such a sacrifice and releases him back to Victoria. Victoria's new husband demands that his bride return to him so that he can have what is rightfully his, her dowry. He learns the family has no money and is furious. The Corpse Bide realizes that she is in the presence of her murderer. His anger, and arrogance, leads to his demise as Victoria’s husband and the Corpse Bride find some justice for her own murder. Victor and Victoria are reunited. 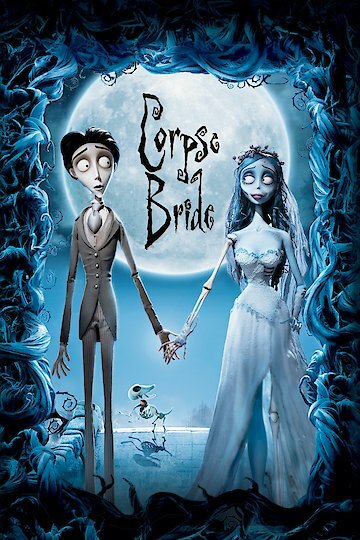 Corpse Bride is currently available to watch and stream, buy on demand at Amazon, Vudu online.